December 4, 2018 at 7:41p.m. 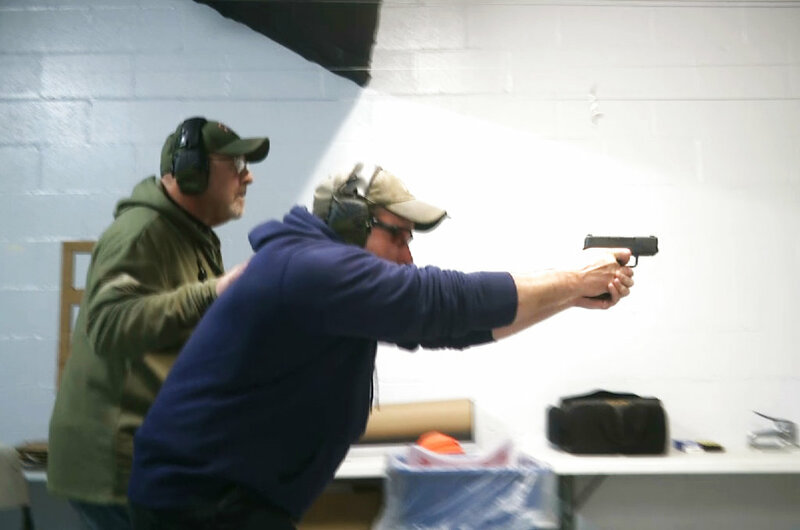 Photo by Associated Press | n this photo taken from a video shot on Nov. 28, 2018, Mike Carnevale places his hand on the back of Mark Hennesey while instructing him at the American Tactical Systems' indoor range in Green Island, N.Y. The application process for handgun licenses would be expanded under a bill before the New York state Legislature. The bill would require handgun applicants to turn over log-in information so investigators could look at three years' worth of Facebook, Snapchat, Twitter and Instagram postings. Google, Yahoo and Bing searches over the previous year also would be checked. Should hateful tweets keep you from getting a gun? Parker’s bill comes as people are increasingly wary about their online lives being tracked. But social postings are commonly checked by everyone from human-resource workers to police officers. A survey of more than 550 police departments several years ago by the International Association of Chiefs of Police found more than half use social media for listening or monitoring and three-quarters of them use it for intelligence. Civil-rights attorney Norman Siegel said he believes bill language directing police to consider “commonly known profane slurs or biased language” is too broad to pass constitutional muster. April 24, 2018 11:41 a.m.
March 23, 2018 8:29 a.m.